Did you know that the 184 million lbs. of California almonds shipped in November is the fifth largest monthly shipment total in the history of the California industry? It’s simply amazing how fast the California almond industry has grown. Year-To-Date, as expected, California almond shipments are flat to last year. With a reduced supply this year, by July 2013, shipments will also be flat to last year. Given the demand-pull against a limited supply, the YTD consumption numbers will remain the figure to watch. With harvest completed, the crop continues to be projected at 1.9 billion lbs. or less. The pressure experienced in October to store the rapidly harvested field run has subsided. Processing for the balance of the year will be on an orderly basis to serve known demand. Business in North America continues to grow, up 5% this year following 9% growth last year. Shipments to China are also up 5%, with December shipments appearing even stronger vs. prior year in spite of some challenges for Chinese retailers surrounding naming conventions. The impact of sanctions in Iran and unrest in Syria have dampened growth in the Middle East, but Europe remains poised to grow in the low single digits for the full year. 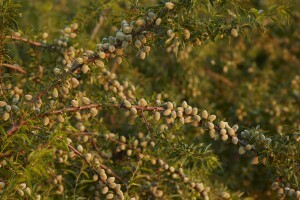 The smaller 2012 crop and subsequent higher prices have created an environment in which both sellers and buyers of almonds remain cautious to make forward commitments. As a result, a higher percentage of current commitments have already been shipped and more uncovered demand remains than in previous years. This bodes well for business through the spring season. Overall, the outlook continues to be for continued strong shipments for the 2012 crop and an ending inventory smaller than last year. Good early rains in California are providing much needed moisture as we look forward to another bloom cycle early next year. Ending on that high point, I’ll see you next month and I hope you enjoy a very Happy Holiday.